Fear is always present in our lives and it’s actually a normal emotion. It can manifest itself as anxiety and or depression or a combination of both. We have been taught that fear is wrong, something to be denied. If we can be even a little bit curious about what is behind the fear, it gives us an opportunity to connect with our deepest hurts and wounds and to transform them. 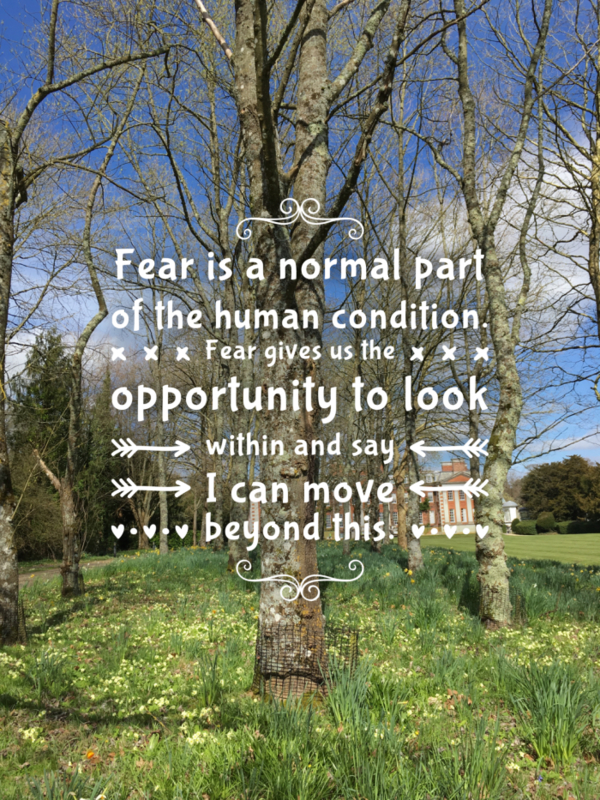 Fear can give us a chance to excavate, to look deeply and deal with behaviours and emotions that are holding us back from fully living our lives. And when we look at it from this vantage point, we diminish the fear and can move forward. I read a book a long time ago which started me on the path of combating anxiety, fear and depression (and there was a lot). The book was called “Feel the Fear and Do It Anyway” by an author called Susan Jeffers. The book was written for people like me (and you). At that time I was suffering post-natal depression which for me manifested as the intense fear and anxiety that I couldn’t be a good mother to my son. The book taught me that fear is normal. The book helped me to move through the fear of being an incompetent mother. By taking the small steps offered in the book, I built the confidence to show up to life in a new way. Building confidence in myself, and my abilities to be a competent mother took a while. And it’s like learning any new skill, it took patience, self-compassion and faith. And I truly believe that we never let go of fear, sure the fear changes, and yet it is part of the human condition. In accepting fear and working with it, we can set ourselves free to live our lives more fully. When I am faced with an emotional or physical road block I can argue with it, I can fight with it, I can swear at it, I can deny it, I can stuff it down and say ‘I’m okay’. Or I can find another way. This can be a process that we have to go through and somewhere there maybe a little crack and some light comes in to the darkness and a new perspective can be found. On the way it is really important to allow ourselves to feel the emotional roller coaster and to be as loving and kind to ourselves as we can be. It is so hard when we blame ourselves and just adds to the situation. Be kind to yourself and know a brighter day will come. Sleep issues, self-esteem issues, eating disorders, excessive drinking or other addictions, work issues, anger and sadness directed towards yourself or others, suicidal thoughts, self harm or mental health worries. If you have experienced any of these symptoms, know that you are not alone and you can begin to overcome them. This involves a rigid way of looking at the world which doesn’t allow for different opinions, options or outcomes. It often stems from a childhood where a parent or person in authority made decisions for you, over which you had little or no control. As an example, imagine you have been invited to a party and you are filled with anxiety. Other examples might include, giving a presentation, going to a meeting or some other situation. If you have inflexible thinking around the situation, you will believe there are only two options, either to go or not to go. To challenge this we look at other options, rather than the ‘all’ of going or the ‘nothing’ of not going. Other options might include going to the party and only staying for a short while, arranging to meet the person whose party it is on another day and time, or to visit the person on the day of the party and choosing not to stay for the big celebration. When we challenge our inflexibility, we see that there are other options available to us and this enables us to make a new plan. And this becomes a new way of thinking, creates new behaviours and has a lasting benefit as you have integrated a new thought pattern into your mind. So let’s take this thought pattern a step further. Because of the anxiety caused by our inflexibility we have decided not to go to the party. This is when negative self-talk can kick in and we start to beat ourselves up for not attending. We say ‘you should have been able to go to the party, you are useless, you’re a failure’. A lot of clients enter the therapy room with these kinds of thoughts which stem from high standards that develop into feelings of failure when they are not achieved. The temperature gage of anxiety racks up and depression sets in. When you start to question your expectations of yourself you may be surprised to find that you have high standards which may be impossible and unrealistic. Often I will hear the words ‘what have I been trying to prove?’ and ‘who have I been trying to prove it to?’ These are very good questions indeed. When a person realises that they are in charge of their own standards, they begin to realise ‘maybe I am good enough, maybe I am okay after all’. What a truly empowering realisation. I have found through my work that there is a pattern to anxiety and stress. If it is not dealt with it can lead to depression and mental health problems. Sadly, I often see people when they have got to breaking point and are barely functioning day to day. It can take longer to recover when you are completely broken. Being better informed, there is a good chance you can alleviate the agony of being signed off work, retreating to your bed or falling into the pattern of harmful addictions which damage health and family relationships. So what are the signs? The beginnings of ANXIETY: It could be shouting at the kids, your partner, yourself or the traffic. These are warning signs that something in your life is not feeling right and you are finding it hard to cope. Physically your heart might be banging in your chest and you might feel an adrenaline surge in your body. Thoughts like “I don’t feel good, I’ll try and force myself to do this thing that I can’t or don’t want to do right now”. If we deny these feelings and sensations for a long time, then we can feel panicky and totally out of control. Often as result we experience anger, panic attacks or mystery bouts of illness which have no logical explanation. If we don’t assess, regroup, take stock and get support in place then the situation intensifies. DENIAL: “Okay I’ll pretend this isn’t happening. It’s someone else’s problem, not my fault. I don’t have any control. I will just sit here and bury my head in the sand and hopefully it will all just go away’ or ‘I’ve just got to get on with this, I have to do this, there is no choice. I’m lucky, someone else’s situation is much worse than mine’. We push ourselves to keep going. We stuff our emotional feelings down with our ‘get a grip’ mentality at the expense of our mental and physical health. Of course this seldom works as the problem gets bigger and the situation becomes even more difficult to cope with. It can be really hard to admit that we’re finding it difficult to cope and a sign of strength when we reach out for help from family, friends or an impartial person like a counsellor who can offer support. RUNNING AWAY: You try to do something, anything in the hope it will make the situation, the feelings disappear. Often people find ways to sooth the anxiety and stress by running towards something else, whether it be having an affair, excessive drinking, taking drugs, sexual addictions, gambling, angry outbursts, and violence towards ourselves or others. In extreme cases people can retreat within their minds, shutting people out, putting duvets over their heads in the hope that they can control the situation and keep themselves safe. “I’ll lay in my bed, it’s the safest place and then nothing can happen to me”. With all these behaviours, life is becoming really impossible and the things you are doing to try and help yourself are actually preventing you making sense of and managing the situation. DEPRESSION: At this point the black dog of depression has descended and in extreme cases the motivation to live is being extremely tested; you may have suicidal thoughts or have attempted to end your life. It can be really, really hard to motivate oneself and you may feel ashamed that you are not coping with life. It can be difficult to ask for help and yet life changing if you do. Asking for help is the very first step, then it gets easier. It takes courage to admit when you’re not coping and an impartial counsellor can support you as you find the impetus to deal with your situation, your feelings, the anxiety, depression, anger and shame. Seeking help always demonstrates your strength and commitment to yourself and counselling can really support you as you get your life back on track. The big question is, are you ready to admit you might need a little help? It is probably accurate to say that most of us were not taught the benefits of relaxation, or even learnt about relaxation in our childhoods or at school. And yet study after study is now demonstrating that finding ways to relax have an important role to play in the way we cope with anxiety, depression and the general joys and sorrows of our lives. When you are relaxed your heart rate slows down and your blood pressure can lower. Your breathing slows down and your stomach can digest food more easily. The stress hormones reduce and your mind becomes more relaxed and your muscles release their tight grip. Concentration and mood improve and sleep quality can improve. Anger and frustration start to clear and your mind is more spacious and can problem solve more easily. When we think of relaxation the obvious form is meditation, and yes meditation can be beneficial to many people. And yet meditation is only one form of relaxation. Anything which keeps you gently focused for any length of time can be a form of relaxation. Running, walking, dancing, writing, poetry, and drawing are just a few examples of activities that can focus the mind. And for each individual the activity to help you to relax will probably be different. What activities help you to focus your mind? Focusing your mind away from your troubles, even for 5 minutes, can give your mind and body a welcome respite, creating space for clear thoughts to arrive and for problem solving to start. And when you are feeling particularly stressed, physically slowing your speech down and slowing your walking pace can also help you to feel more grounded and at ease. Sometimes it can be really difficult to think about taking time out of your busy day to relax as the to-do list is long and time feels short. When you’re struggling with the actual thought of putting time aside for relaxation, you might like to think of it as medicine you are giving yourself, much like the pill you take from the doctor or the vitamin supplement you take in the morning. In this case you are the one giving yourself the medicine and gaining control back in your life. It can be a very empowering concept to know that you are enhancing your own well-being. And sometimes when relaxation is not quite enough to deal with anxiety and depression, it might be beneficial to talk to an impartial person like a counsellor who can help support you in the process of learning to relax. In these times of fear and worry, come and share your anxiety and stress, depression, bereavement, relationship challenges, anger, sadness and mental health issues with the impartial, fully registered and trained psychotherapist Sue Holdsworth, BA Hons, MBACP. And from the 1st June, Sue is moving to the relaxing environment within ‘Scents of Spirit’, Studio 5, at the Fairground Craft and Design Centre, Weyhill, Andover, SP11 0QN. The hurts that you have endured have brought you to the present moment and perhaps it is a present moment that you do not like very much. These ‘hurts’, of themselves aren’t always harmful, but if we endure enough ‘hurts’ in our lives it can cause anxiety and depression. These are the labels commonly used to describe mental states associated with despair, fear, hopelessness, anger, panic and out of control feelings. And then when you add on top of that the thoughts that ‘I shouldn’t be feeling this’ and ‘get a grip’ you are in a warzone with yourself, creating more tension and more stress about the fact that you are actually feeling what you are feeling, in a situation that you do not wish to be in. Typically people deal with intense situations in 3 ways, flight, fight, or freeze. Flight might mean walking away from something or someone or in extreme cases fleeing the country. You could freeze, sometimes to the point that your whole life stops and you are figuratively or physically in your bed with the duvet over your head immobilized and unable to connect with the world. You could become very angry at everything and everyone, causing physical and mental damage towards people and things. Sound familiar? We will all, at some point in our life, feel and act in one or more of these ways which is a normal reaction to being human. So what to do when life throws you a curve ball? BE honest about where you are. If you’re having trouble managing your life, then the quickest way to relieve some of the pressure is to admit to yourself how you really feel. Eg If you hate your job and you keep saying ‘I love it’, you’re clearly lying to yourself and causing added pressure and tension on top of the situation you’re already in. BE kind to yourself. It is so easy to beat ourselves up and give ourselves a hard time. But it is true that when a curve ball happens, we need to take stock and realise that right now we might need to re-group, calm down and then re-evaluate from a more relaxed place. BE mindful. Rome wasn’t built in a day and life is a journey not a destination. The present moment can be a safe harbour where you concentrate on the here and now rather than worrying about what might happen, what could happen, or what might never happen. BE realistic. Sometimes the curve balls in your life can be incredibly hard to manage. Sometimes you can manage them by yourself and sometimes you can’t. Seeking help is never a weakness, but a point of empowerment when you take back some control. And a non-judgemental third party like a counsellor can give you the space to find perspective. Making sense of the anxious, depressed you or the ‘hurts’ that may affected you. And from a physical view, as you begin to find a new perspective, you are literally re-wiring the pathways of your brain. And as you begin to heal from the negativity of the past, you open up space to dwell on the positive moments that have happened in your life. A natural by product of this new way of thinking, allows hopes and dreams to take root and come alive. These more positive thoughts will help you to move forward in your life, knowing that your future can be brighter than it was before. Anxiety can evoke the fight or flight response. A flood of cortisol rushes into your body and you have a sense of fear, dread or apprehension. The affects of this can have us stuck in a non-stretching, non-exciting, uninspiring place of inertia and dullness. And we may convince ourselves that this is the place we really want to be, but who are we really kidding? From the comfort zone we might begin to feel desperate and panicky. In this state something drastic might propel us forwards, in a desperate bid for freedom. In this position we might rush into the deep unknown, ending up in the panic zone, a place which has stretched us way beyond our limits into the abyss of anxiety and stress. This can be as paralysing as the comfort zone, as we get bogged down with terror and a feeling of being totally out of control. It is at this point that many people have a tipping point, ending up lying in a heap and heading towards total breakdown. It might surprise you to know that stress in small, manageable doses can actually be good for us. If we can learn to deliberately move towards change, in small manageable steps, then we are allowing our minds to become more adaptable to the anxiety and stress that life tends to throw at us. And neuroscience has shown us that when we deliberately change the way we react to life we are physically re-wiring the pathways in our brains. We are become more flexible and adaptable to life and as we do this more and more, our ability to manage anxiety and stress becomes easier. TIP 1 Write down a goal you have been putting off because you felt too anxious to do it. Now, acknowledge that in not doing it, you are staying in the comfort zone and that it can feel really horrible to constantly be here, stuck. Think about this, what is the worst that could happen if you took one step towards your goal? What is the best that could happen? TIP 2 Write a list of small, manageable steps that would get you moving towards your goal. This is you moving into the stretch zone. TIP 3 Look at your list, which step is the most do-able right now? The one that says to you “yeah I could do that and it feels okay to do it”. Now see if you can action that very small step. TIP 4 Feel how it feels to have achieved that first baby step. TIP 5 If you’re reading this and thinking, “I can’t do it” know that you are not alone; many, many people find it really challenging to move out of their comfort zone. It can be really helpful to acknowledge where you are and seek some outside help. Support from an impartial, professional counsellor can really help you to move forward. It is a sign of strength and courage to seek help. And remember “a journey of a thousand miles begins with a single step”. Are you ready to take the first step? It is a time of change right now, as we contemplate moving from the breezy warmth of summer into the throes of September. For a lot of people the only certainty we know is that life is about to change whether we like it or not. For some people this will seem an exciting concept and for others it may fill them with anxiety and fear. When change is not what we wanted we can feel like the passenger on a train that is screaming out of the station with us on board. We try to slow the train down, grasping tightly to the handrail, with our heads bowed, not wanting to look where we are headed. We try to control situations, grasp tightly to people and fight the one realisation that the train has left the station, and we are on it whether we like it or not. When we try to control the uncontrollable we bring anxiety, stress, tension, fear and yes sometimes panic into our minds and our bodies. And in extreme circumstances this can play out as frozen panic, where we refuse to get out of bed or in the sad contemplation of ending a life because it is all too much. We may not be able to change the unchangeable but we can discover new ways to manage our behaviour, our thoughts and our feelings about the change. As Nikos Kazantzakis said “since we cannot change reality, let us change the eyes which see reality”. ACKNOWLEDGE the fact that when you keep saying “it shouldn’t be happening’ it is akin to asking the sun not to set or the moon not to rise. Consider this, “I may not like this situation, but right now I am in it even if I don’t like it”. Yes, this can be hard to contemplate but can ultimately lead to less blame of yourself and a relaxation of some of the tension you have been carrying. WHAT’S THE WORSE THAT CAN HAPPEN? Contemplate the worst and the best of change. What is controllable and what is uncontrollable right now? And start from there. CONTEMPLATE THE POSITIVES – is there anything about this situation which is positive, either now or for the future? What is happening can seem very daunting at first and with contemplation and a little trust it may lead to a better outcome. Just contemplating any positives might help shift some of the anxiety and fear around the situation and as Nido Quebein once said “change brings opportunity”. 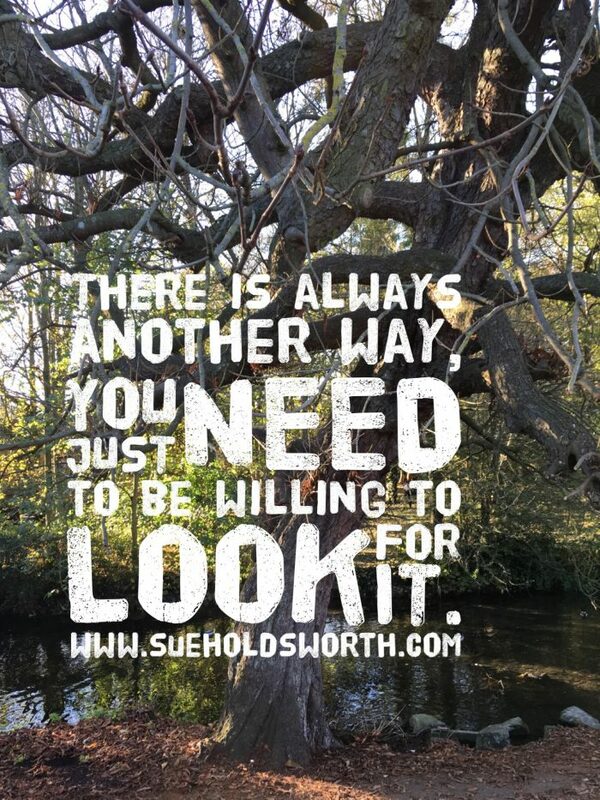 Are you willing to look? Change can create anxiety and stress; it is a common reaction to an unfamiliar situation. Take a breath, slow down and evaluate your situation. Write an emergency self-care list that you can go-to whenever you are feeling overwhelmed. It might be a good idea to compile your list with a professional who can help you pinpoint tools and strategies that will work for you in times of stress. On my emergency self-care list is music, meditation and breathing. What’s on yours? Look for healthy ways to sooth yourself and then implement them. This is your emotional life line which needs to be pulled out whenever you feel the fear or panic of change taking hold. Keep the list in your wallet or handbag so that it is always accessible. Just looking at your list can help you to feel more reassured. Look at the change objectively, mind dump all of your hopes and fears about the change then actively look at how you can manage the situation. Set goals and then break these down into manageable steps which help you to bend outwards, motivating you towards the change. As Rona Barrett said “The strong individual is the one who asks for help when he needs it”. Invite your friends and family to support you and seek professional support when the going gets tough. A professional can help you to develop your own strategies and confidence to deal with change. “The secret of change is to focus all of your energy not on fighting the old, but on building the new” –Socrates. Are you ready to take the first step? “Every tomorrow has two handles. We can take hold of it with the handle of anxiety or the handle of faith” Henry Ward Beecher. Anxiety can feel like butterflies in the stomach when approaching a doctor’s examination, or feeling sick when speaking in public. Physically your heart can start to pound and your stomach can feel in knots. These are normal reactions to the fear and worry that these types of situations can provoke. Soon the event is over and the mind and the body return to their normal rhythm. It becomes more of a problem when daily events in life lead you to feel high levels of anxiety that leave you feeling overwhelmed and terrified by what might happen or what has happened. You can feel so out of control that you begin to implode right there on the spot. This level of anxiety may feel like a heart attack; where your heart starts pounding, your breath shortens and you feel like you might pass out. The mind/body has gone into overdrive and the fight or flight instinct has kicked in. Both Johnny Depp and Kate Moss have admitted to being afflicted with it and and Amanda Seyfried, has said “it just stops your life”. When the body and mind are in a constant state of high alert and you are regularly being bombarded both physically and emotionally it can tax the mind and place enormous pressure on vital organs of the body. And if this is happening on a daily basis it can leave you feeling drained, hopeless and out of control. This can lead to self-harm in various forms in the hope of releasing the tension or to a need to block out what is happening through drink or drugs. This constant anxiety bombardment can have serious implications for your physical and mental health that may go further than the original anxiety you were battling. Not being able to be still and calm. Admitting you have anxiety is a huge first step and being able to talk about it can really help relieve some of the pressure. A counsellor can help you to see your situation more clearly and help support you as you work through your difficulties. Indeed the NHS recommends talking therapies like counselling can help you to cope better with your anxiety. When you are feeling anxious, deliberately breathing more slowly can help your body and mind to calm down. Try this – allow a pause between each in and out breath, counting to 5 when you breathe in, allowing a pause and then counting 5 as you breath out. As you concentrate on the breath with your counting you are re-directing the mind and calming down. When we distract the mind with another activity, we stop thought about the subject which might be causing our anxiety. You are deliberately shifting your focus and can reap the benefits of feeling relaxed and more at ease. Try it for yourself: spend 10 or so minutes listening to some favourite music, doing a Sudoku puzzle or any other activity that you like to spend time doing. It can help your mind and body to relax, to let go of some of the tension and later, may provide some clarity and insight into your situation. There is lots of research which says that exercise releases beneficial chemicals which help to soothe your body and ease your mind. Keep a diary which tracks your daily mood and anxiety levels. Look at your daily life and list situations where you have been anxious. See if there are any patterns to your anxiety. As you begin to understand some of your particular triggers you will have a better understanding of what needs to change or what you need to put in place to support yourself. You are the best expert on what your own unique triggers are. Add your food intake to your daily diary. Look for patterns of anxiety which might be linked to the food you are eating. It is a well known fact that a high calorific diet, with lots of fat and sugar can have a detrimental effect on our bodies and our minds. As a starting point if you would like a blank copy of my mood and food diary then please email me. For me it is yoga and meditation, for you it might be patting your dog or playing a game on the computer. Whatever makes you feel happy, restful and calm can help put your mind and body into a more peaceful place. All of this info can help you to manage your anxiety and it is up to you whether you are willing to give them a go. Remember you are not alone, one in five of the population will be dealing with anxiety or will have dealt with it. Help is out there if you are willing to try it or find it. It is the month of May and on the 23rd of this month the wildest, wackiest family will hit our TV screens in the shape of the Eurovision Song Contest. This year we celebrate the 60th anniversary of the contest that brought us Abba, Bucks Fizz and the bearded lady Conchita Wurst. It has had me musing about ‘family’ and the many characters from the Eurovision Song Contest which can be seen as reflections of the characters that make up our own families. As Amos Oz has said “I find the family the most mysterious and fascinating institution in the world” and this feels particularly relevant to the family of Eurovision which has spanned six decades and given us over 1400 songs. When I relate Eurovision to my own family I am reminded of the differences between the people that have made up my family landscape and the various performers that take to the stage each year in the competition. In my own family I have struggled to find my own sense of identity and my own sense of belonging. I am reminded, as I watch the Eurovision Song Contest that my struggle to accept myself, reflects a wider struggle that human beings often experience as they strive to feel accepted and acceptable to their families and to themselves. This is played out in the many countries, costumes and songs that make the Eurovision Song Contest what it is and the human strive to be seen as acceptable to others. These situations are played out both on the concert stage and on the stage which is our daily lives. Growing up within my family, I experienced a feeling of being different, surrounded by people that I thought were more creative, colourful and confident than me. I often felt like the ugly duckling, longing to be the beautiful swan that I felt must be somewhere inside me. When I married I still felt this sense of not belonging, as I was now surrounded by an even larger number of clever, creative people. It has taken me a long time and a period of reflection through counselling, for me to realize my own uniqueness and the contribution that I make to my own life and that of my family. I am reminded that these are common themes that are played out in the Eurovision Song Contest, when countries get together to showcase their own unique style. It becomes an opportunity to celebrate the uniqueness and the creativity of each country and a reflection of all of us as valid, acceptable human beings. It can be a challenge to accept our differences and it can become easy to compare ourselves to other family members and find ourselves lacking. When I accept that I am okay just as I am and that I am just as worthy as other family members, I feel a peaceful exuberance flow through me. And as I embrace my differences and the contribution I have made to my own family I can love myself and love my family and this opens my heart to the possibility that we are all okay, exactly as we are. And as Conchita sings “rise like a phoenix” I would concede that the Eurovision Song Contest has embodied this sentiment since its conception in 1956.